After a fair bit of planning and preparation, helped by Amy our University student volunteer, Mike & I arrived bright and early to set up our stand for the Coniston Country Fair on 22nd July. It was a warm, sunny day and the show site was buzzing. Our stand was near the show ring so we had a view of what was on show. That said we were busy all day and didn’t have time to do much watching! 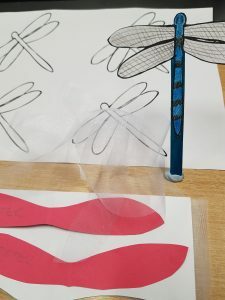 Children got very creative with pipe cleaners and wooden beads and produced some beautiful dragonflies and mayflies, as well as colouring in a badge and making kingfishers on sticks. They were also fascinated by some of the minibeasts but probably not quite as much as many of the adults who stopped by to take a look in the trays. 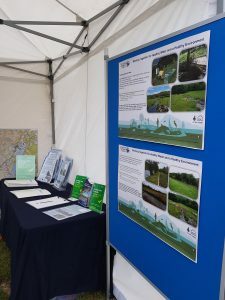 Some visitors to the stand wanted to know more about blue-green algae and others asked about how the lack of rain would affect the becks, fish and wildlife. We spoke to a couple of landowners and contractors about the work of the project too. 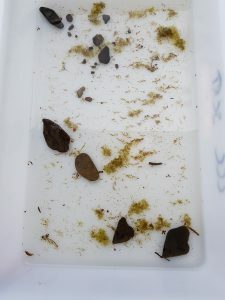 All the freshwater invertebrates were returned safely to the lake and overall it had been a brilliant and busy day!